Heat up oil and fry the potatoes lightly and keep aside. 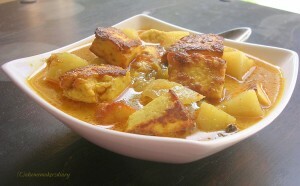 Fry the paneer in the same oil and put it in warm water. Heat up the ghee in a vessel, mix in the cumin seeds and let it splutter. Mix in the cumin paste mixed with a little water, ginger juice and turmeric powder. Mix in the potatoes, green chillies, garam masala powder, sugar and salt and cover and stir fry till the potatoes are tender. Take off the paneer from the water and mix in to the potatoes. Mix in milk and the remaining water and allow it to simmer (boil slowly at low temperature) for another 2 to 3 minutes.